LOC Precision MAGNUM Kit - One of the ISP PERFORMANCE SERIES of kits, which feature factory pre-slotted airframe and through-the-wall fin construction and high power motor capabilities, the MAGNUM is the perfect kit to make your Level 1 and Level 2 certification flight with. The 54mm central motor mount is accompanied by two 29mm outboards for clustering or air starts. The J350-M motor achieves apogee at around 2200 ft using the optional MMA-4 38mm motor adapter. We upgraded the shock cord to 25' of 9/16" tubular nylon and added a CEC-2 chain connector to the SCMBA-25 shock cord mount for heavy duty flying. 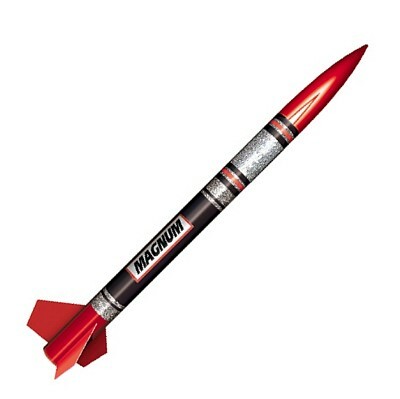 This rocket should be in every collection! Parachute Recovery.